I see articles every day about this new “Millennial” generation and how entitled they feel. Half of the articles are written from the perspective of the employer who seems almost bitter at the fact that they HAVE to hire these lazy, self-absorbed, altruistic kids. The other half are written from the perspective of a millennial blaming all of their issues on society, the government, or the economy. I feel this has created a them vs. me mentality and it doesn’t have to be like that. The goal of this blog is to help shed some sensible light on a situation that is affecting every company I speak to professionally, as well as the companies I choose to do business with personally. Your ability to attract and recruit talent from the millennial generation will determine your fate as an organization long term. Your ability to adapt to the subtle cultural changes between generations will determine the legacy you leave behind. 1. Rampant adoption of smart phones. I guarantee that a large percentage of your candidates, whether they are welders or software engineers, have smart phones and use them daily. A recent Glassdoor study found that 68% of candidates are researching jobs on their smart phones. If a candidate lands on your careers page on their iPhone, what are they going to find? 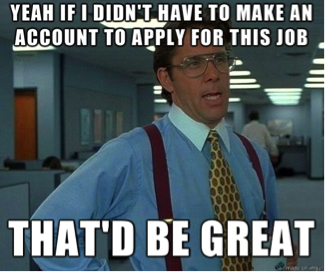 If they are actually interested in a job at your company, how can they notify you of that right away? 2. The recession of 2008: The job market in 2008 was absolutely flooded with new applicants and fewer jobs, thus making it a “sellers market.” Companies had the luxury of selecting the very best of the very best and saw that by hiring the right people, they were able to do more with less in leaner times. Companies had to get smarter about wherethey were spending money to find quality candidates without opening their doors to the massive quantities of job seekers that resulted in a very labor intensive screening process. This caused the beginning of the rise of recruiting automation. Analytics is everything and once you taste what it feels like to have a more efficient and productive workforce, will you ever settle for less again. 3. The continued rise and adoption of social media as a relevant form of communication. As the world globalizes and families relocate and spread out for better opportunities, social media is the glue that is somehow making it all okay. It’s quickly replacing the telephone, email, community newsletters, newspapers, and cable TV. I certainly don’t go to the phone book to find a good restaurant anymore and if I want an opinion on something, I post it on Facebook! Employers find quality candidates where they live and interact with the world on social media- not by saying it themselves, but by getting their employees to say it for them. It’s the new way word of mouth is spread. If you think for a second that you don’t have a presence on social media already, you are sorely mistaken. Every day I hear about my friends’ successes and frustrations at work on Facebook. Work is such a big part of our lives that it only makes sense to mention it during a casual conversation with friends online. That being said, I also regularly see posts about raises, promotions, IPO’s, and new funding announcements on my newsfeed and when I see a post about a job opening at my friend’s company, I listen. I want my friends to be happily employed and since social media is the great connector, if I can share that opportunity with a friend, you better believe I will. If you aren’t controlling, or at least contributing to the conversation on social media, who is? 4. The rise of the millennial: By 2018, 50% of the workforce will be millennials. That means more than half of your employees, as well as candidates will be, or are already, millennials. Say what you want about this generation, of which I myself represent the first wave of, millennials have always interacted with the world differently and expect you to follow suit. It’s not because they aren’t interested in you that they don’t want to fill out your lengthy application, or create yet another account to some website, (ensuring additional spam, more than likely), just to apply for your job. It’s just that they know better. They’ve had access to information on the Internet since before middle school. They learned how to build a website when they were 12 and they know that there is no point in writing something down when they can always find it again on a website. If you force your job seeker to go through an outdated application process, you are going to lose them before their ADD brains even complete the first step. Time has always been precious to every generation, but for a millennial time wasted doing redundant activities when there’s always “an app for that” is excruciatingly painful. Technology has progressed so quickly for this generation that they just assume they will need to re-buy their electronics and software every two years. If you represent your company with a website that hasn’t been updated since the 90s, a millennial is going to immediately feel like they don’t fit in at your company. This generation also expects automation. Why on earth would it take you more than 5 minutes to send me a confirmation letter about receiving my application? How could you possibly need more than a week to decide if my résumé warrants a phone screen? At the end of the day, companies HAVE to change and adapt to stay competitive. The cost of taking whatever you can get is unquantifiable (cost to hire + cost to train + cost to rehire + cost to retrain, lost production costs to not have skilled employees producing in a role, cost to morale and retention to bring on low quality hires, etc). If you find yourself in this category, ask a millennial to apply for a job on your company website. Write down the feedback that they give you and consider what that experience is doing to your employer brand. How many candidates are you turning away with your negative curb appeal? Now, relax and remember that you can always invest in new technology that works like your candidate does to help you convert more “shoppers” to “buyers” for far less money than it would take to advertise your jobs to more candidates . Most importantly, consider everything I’ve mentioned has happened in the last 7 years alone! How is your recruiting technology addressing your needs both today and tomorrow?